One of Disney's most popular modern creations returns on DVD in The Little Mermaid - Ariel's' Beginning which begins where it all started for our daring little mermaid. The best aspect of Ariel's Beginning is the animation which is a true delight to watch that features some extraordinary Disney animation, ensuring that this presentation neatly fits into the Little Mermaid mythology. Running at 74 minutes and without spoiling the movie, it tells of Ariel's (Jodi Benson) love for music and upon chance, she discovers a secret underground music club which unleashes her love for music. Unfortunately for Ariel, her father King Triton has banned all music within his Kingdom and from there, the adventure for our little mermaid begins as she attempts to bring back music within the Kingdom of Atlantica. Joined by her friends of both the mermaid and fish variety, Ariel faces the daunting task of going against her father's wishes and restoring the magic of music to her world. 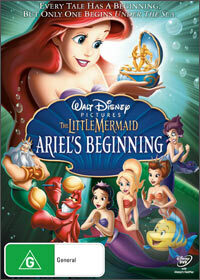 Featuring music, action and some great comedic scenes, The Little Mermaid - Ariel's Beginning is the perfect DVD for fans of the original or for girls just discovering the magical wonders of Disney. Once you have finished with the main feature, the disc also contains some great special features from deleted scenes, Backstage Disney and The Little Mermaid: Under the Sea and Behind the Scenes on Broadway.